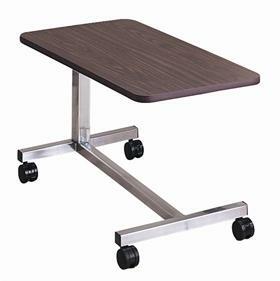 Our patient room tables can be seen in numerous health care facilities and nursing homes throughout the country. Choice of 2 sizes — our “low” overbed table with a walnut grain laminate top and our “standard” overbed table in choice of finishes. Both tables are 15″ x 30″ in size — standard table is 18″ higher than low table. Convenient tilt-top feature for easy reading and writing now available. Please inquire!